Located on Collins Avenue and Lincoln Road, Pizza Bar has the biggest and best pizza on south beach. Watch all your favorite sports games on our 60 inch TVs, and enjoy great food and beer specials. Known for our 30 inch Pies and serving up the biggest slices on the beach, Pizza Bar also has calzones, sandwiches, salads and wings. Up for a challenge? Stop in and try our Kiss of Death Chicken Wings contest- Devour 8 Wings In 8 Minutes, receive a $50 Pizza Bar Gift Card. Visit Our Website To Place your order. We’re open till 5am and deliver late. 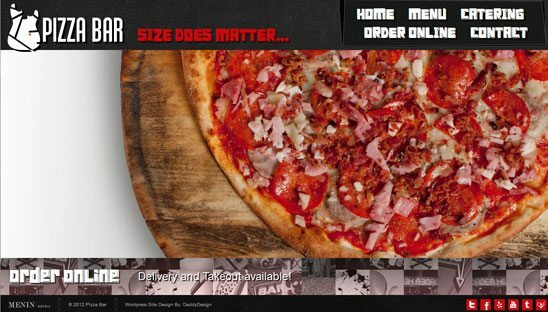 We used the Custom WordPress Splash page theme we created for other Menin Hotel sites then we branded it with Pizza Bar’s graphics. This is a 1 page splash page with Menu links that open lightbox windows. Also has a rotating background that we created custom site options in the back end which allows our clients to easily maintain.